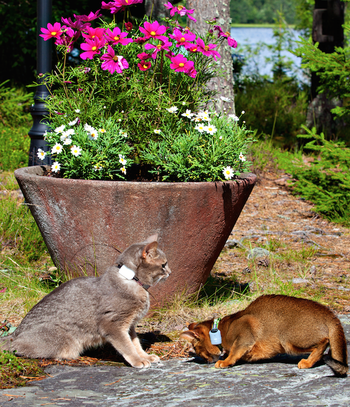 Find your cat easy with SmartCat PetFinder a Pet tracker for cats and dogs! You can have up to 4 tags registered on PetFinder M500s, and it has a range up to 500 meters! (free line of sight). The M500s tag is the smalles tag in the world, what we know, and weighs only 4,2grams. 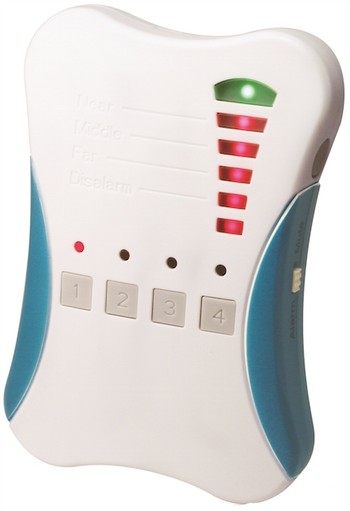 The PetFinder M500s consists of one remote and 2 tags. So this packages is suitable for You who have 2 cats or kittens. You can add another 2 tags to this remote. So easy and light for your cat to wear! SmartCat’s PetFinder will keep you calm and give you peace of mind knowing you can track your cat easy. Are you worried where your cat might be? Keep calm with your SmartCat PetFinder a pet tracker which helps you find your cat. When your cat is not coming, it might be trapped somewhere and in need of your help. An extra peace of mind for you and your friend. When your pet has wandered off to an unfamiliar place, it can be scared and afraid. Even if someone sees your cat, it is not that easy to call on a scared cat which you don’t know. A frightened cat can wander even further to hide somewhere and then it might be too scared to cry for help. That’s when it is good to have your SmartCat PetFinder. The Pet tracker will help you locate your cat. 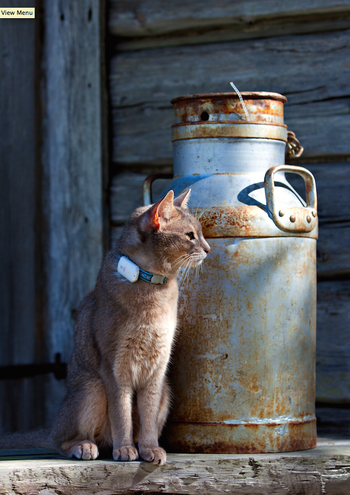 The PetFinder M500s can track your cat within a range of up to 500 meters (free line of sight). 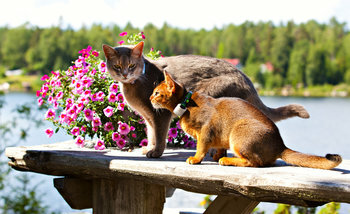 With the RF technology you will have both visual and audio help to guide you in which direction to go to find your cat. And if you use the proximity alarm, you will be notified when your cat wanders longer than your proximity fence. Curious cats easily get themselves to places they never been before, and hide into your neighbours cellars or garage. SmartCat PetFinder can then track down your cat within 500 meters (Free line of sight) and to be able to pinpoint your cat’s position up until that last centimeter, you can just turn off the sound on your remote, and instead listen to that very small beep in the tag around your cats neck. 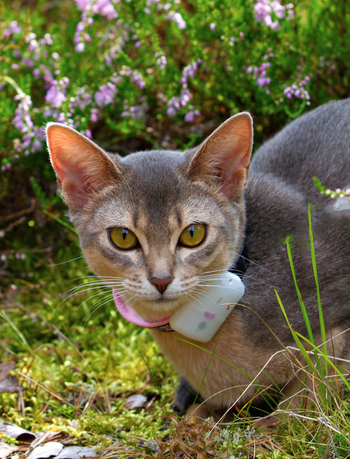 The tag which you have in your cat’s collar, has the smallest little beep when you search for your cat with your PatFinder. If you repeatedly give your cat treets or good food when you use your PetFinder, your cat will easily learn that when it beeps in his/her collar it is time to come home. This is very useful and most cats come running when you start searching with your PetFinder. With SmartCat PetFinder you can track your cat within a range of up to 500meters (free line of sight). 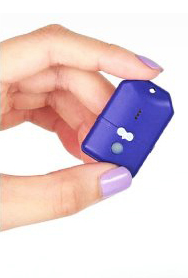 SmartCat PetFinder M500s Tag is a very small and light tag, and weighs only 4,2 grams. Even a small kitten can wear this tag. 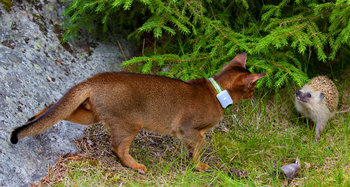 In comparison to cat GPS trackers, the PetFinders from SmartCat has far longer battery life. Rechargeable batteries for the tag: LIR3023, recharge once a week. On / off, mute, and the search button. Red = Weak signal / Wrong direction. Integrated audio: The remote will beep faster and faster to indicate the right direction. A pet tracker on RF technology is a better choice than a GPS tracker for many reasons. For example, the PetFinder has far longer lifetime on the batteries, as the GPS tracker you need to recharge every day. The PetFinder tag weighs only as little as 4,2 gram, light en easy for your cat to wear compare to a pet GPS. A Pet GPS tracker is also a lot more expensive.